It’s called the “common cold” for a reason. Your child will probably have more colds than any other type of illness. Most kids have had eight to ten colds by their second birthdays and they continue throughout childhood (and their parents get them – usually from the kids). It’s the most common reason that children miss school and parents miss work. If anything, using the term “common” with cold is an understatement. The body has a relatively small number of symptoms with which to respond to an ever-changing, wide variety of viruses. These symptoms are often the body’s attempt to get rid of the virus and to minimize damage. Sneezing ejects the virus from the nose, coughing from the lungs and throat, vomiting from the stomach, and diarrhea from the intestines. Fever makes it difficult for the virus to reproduce. The common cold is our name for a specific constellation of symptoms, a pattern of illness that can be caused by a variety of different viruses. Over 200 different types of viruses can cause a cold! Rhinoviruses, which means “nose viruses,” are the most common. Respiratory syncytial virus (RSV), adenoviruses, enteroviruses, and a host of others can produce colds. Most people are sick with each specific strain of cold virus only once in their lives. Who gets a common cold? Colds are the most prevalent infectious disease. Children average 3 to 8 colds per year (younger children and boys are on the higher end of the range). Children are the major reservoir of the many cold viruses. They usually get colds from other children. When a new strain is introduced into a school or day care, it quickly travels through the class. Parents get about half as many colds as their children do. Moms tend to get at least one more cold per year than dads. Colds can occur year-round, but they occur mostly in the winter (even in areas with mild winters). In areas where there is no winter, colds are most common during the rainy season. What are the symptoms of a common cold? The three most frequent symptoms of a cold are nasal stuffiness, sneezing, and runny nose. Throat irritation is often involved (but not with a red throat). Adults and older children with colds generally have minimal or no fever. Infants and toddlers often run a fever in the 100 to 102 degree range. Once you have “caught” a cold, the symptoms usually begin in 1 to 5 days. Typically, irritation in the nose or a scratchy feeling in the throat is the first sign, followed within hours by sneezing and a watery nasal discharge. Within one to three days, the nasal secretions usually become thicker and perhaps yellow or green. (This is a normal part of the common cold and not a reason for antibiotics.) During this period, children’s eardrums are usually congested and there may be fluid behind the ears (OME), regardless of whether or not the child will end up with a true bacterial infection. For children with asthma, colds are the most common trigger of asthma symptoms. They are also the most common precursor of ear infections. When someone has a cold, the nasal secretions are teeming with cold viruses. Coughing, drooling, and talking are all unlikely ways to pass a cold. Sneezing, nose-blowing, and nose-wiping are the means by which the virus spreads. You can catch a cold by inhaling the virus if you are sitting close to someone who sneezes, or by touching your nose, eyes, or mouth after you have touched something contaminated by infected nasal secretions. How long does a common cold last? The entire cold is usually over all by itself in about 7 days, with perhaps a few lingering symptoms (cough) for another week. If it lasts longer, consider another problem, such as a sinus infection or allergies. How is a common cold diagnosed? A cold is defined as a short-term, contagious, viral illness with nasal stuffiness, sneezing, runny nose, throat irritation, and little or no fever. The diagnosis is based on identifying the appropriate symptoms, exposure, and time course. Sometimes it is difficult to distinguish a cold from other problems such as allergies, influenza, strep throat, or sinus infections. A history and physical exam, sometimes with supporting lab work, will usually make the distinction. Antibiotics should not be used to treat a common cold. 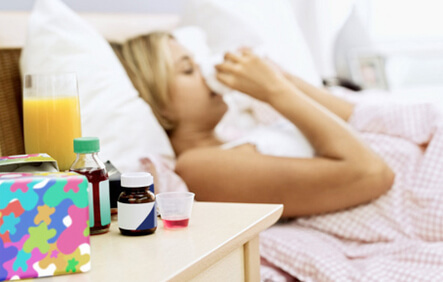 Thick yellow or green nasal discharge is not a reason for antibiotics, unless it lasts for 10 to 14 days without improving (possible sinusitis). New anti-viral drugs could make runny noses completely clear up a day sooner than usual (and begin to ease the symptoms within a day). It’s unclear whether the benefits of these drugs outweigh the risks. Most cold treatments are aimed at controlling troublesome symptoms. Over the counter cold medications are no longer recommended for children under 2 years of age, and are strongly discouraged for children under 6 years of age. Chicken soup has been used for treating common respiratory illnesses at least since the 12th century. A study published in the October 2000 issue of Chest explains why this home remedy has held on so long — it may really help! In addition to the infection-fighting benefits of the heat, hydration, and salt that have previously been described, these researchers looked at the direct biologic activity of the soup itself. Buckwheat honey (a form of dark honey) can help calm coughs caused by the common cold. One study found that buckwheat honey was better at treating coughs than dextromethorphan (a cough suppressant found in common cold medications such as Robitussin DM). The recommended dose is ½ teaspoon for children 2-5 years old, 1 teaspoon for children 6-11 years old, and 2 teaspoons for children 12-18 years old (Arch Pediatr Adolesc Med. ; 2007; 161(12):1140-1145). Honey should not be given to children under 1 year of age, however, as it is associated with infant botulism. How can a common cold be prevented? It might seem overwhelming to try to prevent colds, but the number of colds can be decreased. Children average 3 to 8 colds per year. It is certainly better to get three than to get eight! Colds can be spread by airborne, contact, and droplet transmission, as well as by fomites. They can be prevented, both by decreasing the exposure to germs and also by boosting your child’s immunity. Switching: Using a day care of 6 or fewer children dramatically decreases the germ exposure (and illness), especially in the winter months. Unfortunately, this is not the most practical option. The Not-So-Secret Weapon: We all know that hand washing is a good idea, but when a day care actually does wash children’s and provider’s hands at key moments, the results are spectacular. Key moments? The most important times are after nose-wiping, after diapering or toileting, before meals, and before food preparation. Before a child picks his or her nose would be nice but is not quite practical. Instant Hand Sanitizers: Talk about convenient! A little dab will kill 99.99 percent of germs without any water or towels. It uses alcohols to destroy germs physically. It is an antiseptic, not an antibiotic, so resistance can’t develop. And here’s the cool part–it’s fun. Many kids think it’s a treat to get to use it! We asked our son’s day care to try it, and they began washing at all those important times. Disinfection: Cleaning commonly touched surfaces (sink handles, sleeping mats) with an EPA-approved disinfectant has been proven to decrease the number of colds. Paper Towels: Use paper towels instead of shared cloth towels. Avoid Unnecessary Antibiotics and Antibiotic Soaps: The more kids use antibiotics, the more likely they are to get sick, with longer, more stubborn infections caused by more resistant organisms. Breastfeeding: Breast milk is known to protect against upper and lower respiratory tract infections even years after the breastfeeding is done. Kids who don’t breastfeed average 5 times more ear infections. Cigarette Smoke: Keep your child as far away from it as possible! Exposure to second-hand smoke is responsible for many health problems, including millions of colds.Sleep: Late bedtimes and poor sleep leave children vulnerable. Water: Getting plenty of fluids supports immune function. Yogurt: The beneficial bacteria in active yogurt cultures can help prevent colds (as well as tummy aches, diarrhea, food poisoning, food allergies, eczema, sinus infections, bronchitis, and pneumonia – among other things). Zinc: Children who are zinc deficient get more infections and stay sick longer. Upper respiratory tract infection, URI, Nasopharyngitis, Viral rhinosinusitis.